No trip to India is complete without a ride on the train. Photo by Rathish Gandhi / Unsplash. 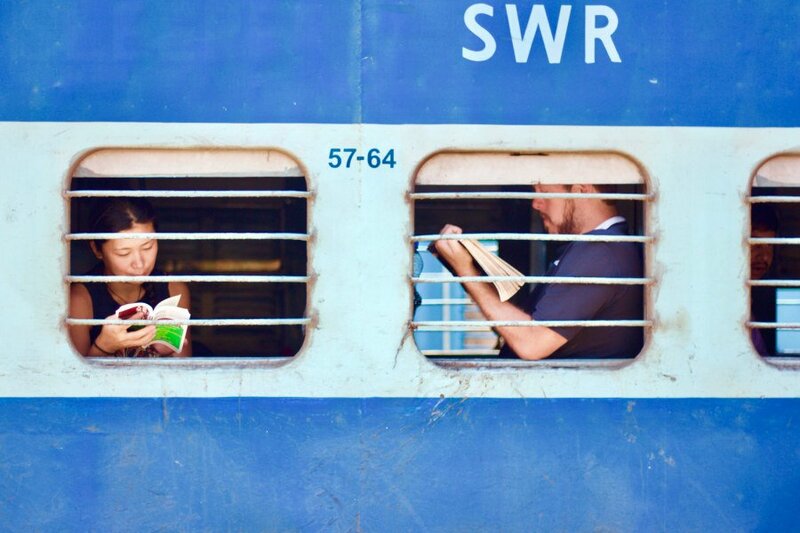 Fathom's Kim VanderVoort makes a strong case for riding the rails around India. For starters, you'll need the right mindset and a good app for tracking your seat. INDIA – People say the trains in India are crowded, dirty, and best avoided. I disagree. Indian trains are far from the apex of luxury, sure, but they offer a different sort of allure. After months traveling across the great country, my most vivid memories consist of the wordless generosity of matriarchs with homemade chapati, the chatty Keralan photographer who made us feel safe when we ended up in the wrong car, and the innocent curiosity of intrepid children wandering toward our seats, only to turn bashful at our hellos. That is to say, there are few better places to experience the spirit of India than on the train. However, no experience worth having is without complications, so here are my tips for riding the Indian Railways. After all, if you're going to India, you're already looking for a little adventure. Book in advance. Busy train lines can fill up weeks ahead of time, especially during peak season in vacation spots (like Goa in December). I was traveling with my friend, and we showed up for our first ride after finding out we were on the waitlist for seats in AC 3-Tier. At the time, we didn't realize that we could check our PNR (Passenger Name Record) status to see if we had moved up on the waitlist before arriving at the train station, so when we got there, the train attendant relegated us to Sleeper Class, where we thought he meant there was room. What he really meant was it didn't matter if there was room. Know what you're booking. There are many different classes to choose from, depending on which train you're taking. First class is air-conditioned and two-tiered, with four beds in each private compartment. By first-world standards, it’s not terribly expensive. AC 2-Tier is the same, but not quite as nice, and there are no private compartments. AC 3-Tier is air-conditioned, but there are three tiers of beds, so once the middle bed is pulled down (almost like a Murphy bed), it's hard to sit up straight on the first and second tiers. Sleeper class is three-tiered, not air-conditioned, and can get pretty crowded. At major stops, like New Delhi, Sleeper Class can be a bit of a free-for-all. There are chair cars for shorter rides, in which passengers are seated, like on a regular train. Make sure you're in the correct seat. When we made our way to Sleeper Class that first trip, we didn't yet understand that each bunk is individually reserved. For the first five hours of the ten-hour trip, we spread out like queens on bunks we believed to be open. But when we got to Delhi, new passengers flooded the train, including a family whose tickets were for our seats. With no seats to claim, my friend ended up sitting upright on a top bunk, wedged in between a handful of Indian men (some kind, some excessively curious), while I found space on the higher of two bunks that belonged to a couple, who generously let me nestle against their luggage. It was a tight squeeze. Claim your seat. If there's someone sitting in your seat (and you're sure it's your seat), kindly show them your ticket and ask them to move. In some three-tiered cars, another passenger might sit on a lower bed toward the start of the trip before pulling the second-tier bed down or climbing up to the top tier. It's your choice whether or not you'd like to let them to stay, but the bed, in its entirety, is yours. Look for station agents if you need help. Depending on the station, train schedules can be hard to read at times. If you have your ticket confirmation on you, a station agent can usually provide some information as to when it will arrive (if it's late) and what track it will arrive on. Ladies, cover up. Modesty reigns in India no matter where you go (except Goa's party beaches), and the trains are no exception. You will draw extra attention to yourself if you're not covered. As a foreigner, you'll be getting enough stares as it is. The Cleartrip app. It's especially useful for train travel in India. Read more about the app here. A mummy liner. They'll offer you sheets, which are totally clean, but if you're picky like me, a sleeping bag liner comes in handy. My favorite is from Cocoon. Shoes that are easy to take on and off. Leaving your shoes on while resting your feet on your bunk would be gauche, and stepping on someone else's bunk with your shoes on would be downright rude. Warm clothes. Unless you're in Sleeper Class, they will crank the AC. Water and snacks. Once settled in, I rarely liked to leave my seat. The right attitude. Someone once told me that if you arrive in India with open arms, she will embrace you. If you don't, she will rebuke you.